There's not a great deal written about Bramley as like many others it was keep semi-secret and not even marked on OS maps until after closure in the mid eighties. I did a number of exercises there and at one time they used ex-LT underground stock because the curves were so sharp. It was leased as ammunition storage to the U.S. for most of its post war period. Diverging a little, this links into another story. There was a huge secret bunker and underground town near Corsham served by a spur in Box Tunnel Wiltshire. There was always a rumour that this was also served by an underground railway direct from Whitehall/Buckingham Palace. Impossible of course. To add fuel to this rumour underground carriages (for Bramley) were very occassionally seen in the vicinity of the West of England main line around Reading. ....Anyway It would be interesting to do a little research into French military railways. We have a disused one serving the air base at Evreux near here. diverging a little but when i worked in Mod plod CID i had a job at Bramley after Gypsies had entered the site to see what was worth stealing. it caused alarm and consternation as there was a huge amount of shells containing mustard gas buried there ( the site has now been cleared so dont bother looking!! Diverging a little more (along Carl's line, as it were!) as a young(er) man I did an MoD apprenticeship at the Royal Naval Stores Depot at Copenacre, just outside Corsham. The whole complex comprised surface and underground facilities at 3 sites: Hartham (where the Training Centre was situated), Monks Park and Spring Quarry. Spring Quarry was the largest of them as I recall, and there was an underground museum there - not open to the public - which we got to tour round one time on a visit there. There were lots of areas which were sealed off though, and there was never any satisfactory explanations as to what lay behind the walls and barriers. I'm told that during the War, all the national treasures were moved there, including the crown jewels - whether that's true or not is anther matter. Recently I heard that the Hartham site was up for sale. Carl, if you recall the big bag of electronic bits and pieces that I handed over to you at Troy's do that time a few years ago, I should tell you that is where all that stuff came from! Not the same Bramley I'm afraid...That's the posh one near Guildford. Nice place though, and I didn't know Marchwood actually has/had a station. I just thought it was the military port and sidings. There are stories upon stories about the Burlington Bunkerat Corsham. Just followed the link from that site to the page about RAF Rudloe Manor, to the link to Spring Quarry - some very memory-jerking photos there, and the revelation that there is a spur line from the GWR line at Box tunnel to.... Spring Quarry! Edit - Damn, Carl beat me to it! I went down one of these tunnels in the mid 80’s it was an ammunition storage one with a conveyer belt and tunnel down to ‘Box’ sidings. I have quite a few 35mm slides I must find them out and scan them. There were 2 storage tunnels running for 1/3 of a mile I think that were built like a German bunker, i.e. all concrete, but then they had abandoned the idea and just quarried the tunnels and left the exposed rock face. After the war with the beginning of the Cold War it was earmarked for use as an Emegency government centre but it was soon realised that the tunnels were not deep enough to survive the power of developing nuclear weapons!. I have heard another rumour that there is a supply of preserved steam locos stored underground in case of war, but i think that is a romantic notion! !wishful thinking!! 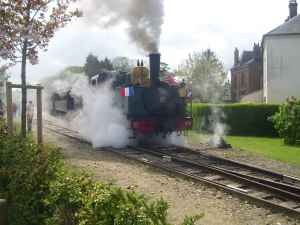 The rumour about the steam locos was on a forum somewhere. I've never heard or seen officially of any steam locos being preserved but why not..... The MOD stores all sort of seemingly 'old' stuff. During the course of my 'green time' I visited Corsham, Copenacre and Colerne. But I recall one 'entrance' had a ramp and you could have driven a vehicle into it. Also although Colerne was long obsolete as an RAF base it's runway continues in use as an emergency landing. Another interesting place was at Dean Hill (again closed now), where the warheads for missiles and other bombs were stored. the narrow gauge line that went down into the depths of the chalk hill (constructed by welsh miners) was made from a bronze/copper alloy (no sparks). would have made a great tourist line!! Take a look at http://28dayslater.co.uk and search for RNAD deanhill. there are some excellent photos of the sheds,lines and bunkers! A few years back I visited the giant German V2 bunker in Wizernes, northern France. 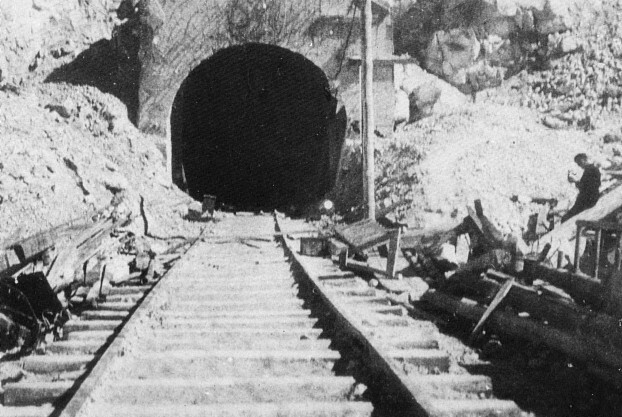 It originally had long railway tunnels basically used for transport material and workers in to the complex and transport rocks and dead workers out of it... 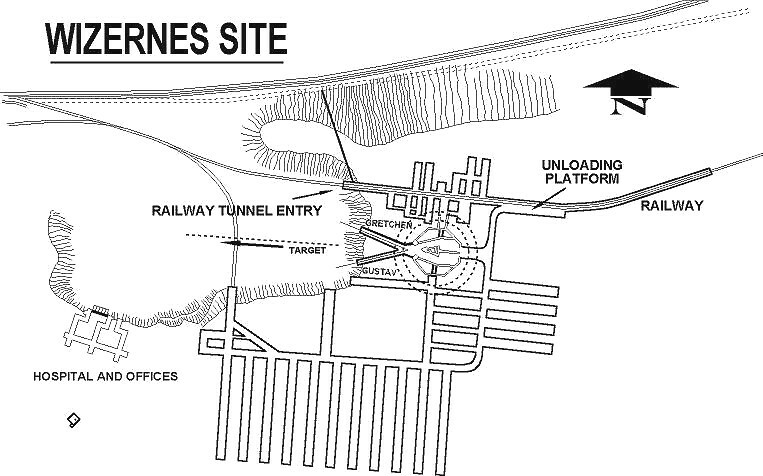 The tunnels stretched out for several kilometers in the complex (see map of the site). One of the old entrance tunnels is the present entrance for the museum. An other German bunker that had railway connections was theWatten bunker complex (12 km in length and connected to the railroad Watten-Duinkerke-Lille). Mimoyecques site (the V3 supercanon).